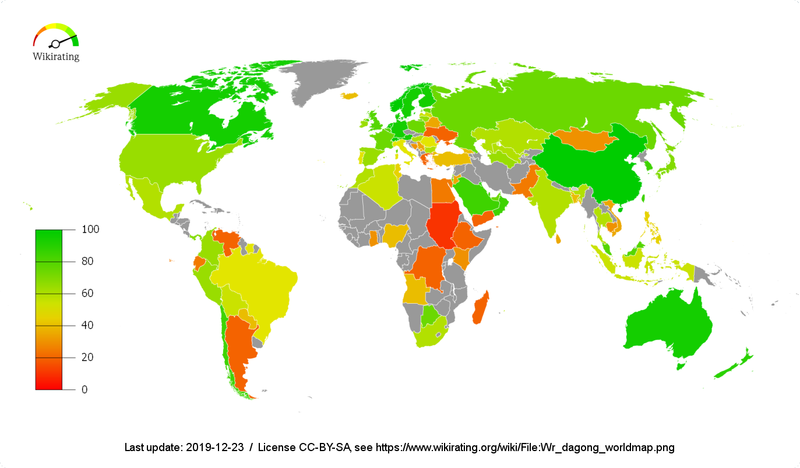 This is a list of countries by credit rating, showing long-term foreign currency credit ratings for sovereign bonds as reported by the three major credit rating agencies: Standard & Poor's, Fitch, and Moody's. The ratings of DBRS, China Chengxin, Dagong and JCR are also included. The list also includes all country subdivisions issuing sovereign bonds, but it excludes regions, provinces and municipalities issuing sub-sovereign bonds. For S&P, a bond is considered investment grade if its credit rating is BBB- or higher. Bonds rated BB+ and below are considered to be speculative grade, sometimes also referred to as "junk" bonds. For Fitch, a bond is considered investment grade if its credit rating is BBB- or higher. Bonds rated BB+ and below are considered to be speculative grade, sometimes also referred to as "junk" bonds. For Moody's, a bond is considered investment grade if its credit rating is Baa3 or higher. Bonds rated Ba1 and below are considered to be speculative grade, sometimes also referred to as "junk" bonds. For DBRS, a bond is considered investment grade if its credit rating is BBB(low) or higher. Bonds rated BB(high) and below are considered to be speculative grade, sometimes also referred to as "junk" bonds. Japan Credit Rating Agency (JCR) is a credit rating agency based in Japan. JCR is a Nationally Recognized Statistical Rating Organization by the U.S. Securities and Exchange Commission. Dagong is a credit rating agency based in China. As of August 2018, the China Securities Regulatory Commission (CSRC) have suspended Dagong Global Credit Rating Co. Ltd. due to lax corporate governance, conflicts of interests, misuse of the official seal of the company, chaotic management, high fees charged to issuers for consulting services, unqualified senior management, and problems with financial models used in bond ratings. China Chengxin Credit Rating Group is a credit rating agency based in China. UN member states that have not been assigned a credit rating by any of the seven rating agencies. Iran Fitch has withdrawn all ratings for Iran following the maturity and full repayment of the last outstanding sovereign eurobond on 21 April 2008. Libya Fitch has withdrawn all ratings for Libya because it does not have enough information to maintain coverage of the issuer. Mali Mali was given a credit rating in 2004 as part of a UN development initiative, but the rating was later withdrawn. ^ "S&P | Ratings Credit Ratings Definitions & FAQs | Americas". Standardandpoors.com. Retrieved 25 February 2013. ^ a b c d e f g h i j k l m n o p q r s t u v w x y z aa ab ac ad ae af ag ah ai aj ak al am an ao ap aq ar as at au av aw ax ay az ba bb bc bd be bf bg bh bi bj bk bl bm bn bo bp bq br bs bt bu bv bw bx by bz ca cb cc cd ce cf cg ch ci cj ck cl "Sovereign Ratings List". Standard & Poor's. January 6, 2017. Retrieved 2015-06-06. Note: this source is continually updated. ^ "S&P cuts Brazil credit rating as pension reform doubts grow". Reuters. 2018-01-11. Retrieved 2018-01-15. ^ "S&P revises down Chile rating - BNamericas". BNamericas. 2017-07-13. Retrieved 2017-07-14. ^ "Standard & Poor's cuts China's credit ratings citing debts". The Economic Times. Archived from the original on 2017-09-21. Retrieved 21 Sep 2017. ^ "Ratings On Estonia Affirmed At 'AA-/A-1+'; Outlook Stable". Standard and Poor's. 9 December 2016. Retrieved 25 December 2016. ^ "Credit scoring agency gives Israel its highest-ever rating". Times of Israel. 4 August 2018. Retrieved 22 February 2019. ^ Fattah, Zainab (2017-05-12). "Oman Cut to Junk by S&P as Crude Oil Decline Imperils Finances". Bloomberg. Bloomberg. Retrieved 13 May 2017. ^ www.rappler.com. April 2018 "S&P raises credit rating outlook on Philippines" Check |url= value (help). ^ standardandpoors.com. "Sovereigns Rating List". Retrieved 8 May 2014. ^ bbc.com. "S&P lowers Qatar's credit rating". Retrieved 7 June 2017. ^ "Slovenia Ratings Raised To 'A+/A-1' On Improving Debt Dynamics; Outlook Stable". S&P Global Market Intelligence. 2017-06-16. Retrieved 2017-09-09. ^ "Ratings for Swedish debt". Retrieved 26 February 2013. ^ "Fitch Ratings — Definitions of Ratings and Other Forms of Opinion" (PDF). Retrieved 2013-02-25. ^ a b c d e f g h i j k l m n o p q r s t u v w x y z aa ab ac ad ae af ag ah ai aj ak al am an ao ap aq ar as at au av aw ax ay az ba bb bc bd be bf bg bh bi bj bk bl bm bn bo bp bq br bs bt bu bv bw bx by bz ca cb cc "Fitch Downgrades Venezuela's Long-Term Foreign Currency IDR to 'C'". fitcratings.com. 3 November 2017. Retrieved 2017-11-05. ^ "Fitch Upgrades Argentina's Foreign Currency IDR to 'B'; Outlook Stable". FitchResearch. 2016-05-10. Retrieved 2016-05-11. ^ "Fitch Affirms Aruba at 'BBB-'; Outlook Stable". Fitch Ratings. 2016-04-26. Retrieved 2016-04-28. ^ "TEXT:Fitch Upgrades Australia's Foreign-Currency IDR to 'AAA'". Reuters. 2011-11-28. Retrieved 2013-02-25. ^ "Fitch Upgrades Bulgaria to 'BBB'; Outlook Stable". Fitch Ratings. 2017-12-01. Retrieved 2017-12-02. ^ "Fitch upgrades Colombia credit rating to BBB, outlook stable". Reuters. 2013-07-05. Retrieved 2014-07-29. ^ "Fitch Upgrades Cyprus to 'BB'; Outlook Positive". 2017-10-20. Retrieved 2017-12-16. ^ "Research Report Viewer". www.fitchratings.com. Retrieved 2016-12-15. ^ "Fitch cuts Egypt to B-minus on political worries". Reuters. 2013-07-05. Retrieved 2013-07-06. ^ "Fitch Upgrades Egypt to 'B'; Outlook Stable". Reuters. 2014-12-19. ^ Espinosa, Veronica (2013-07-16). "El Salvador Credit Rating Cut to BB- by Fitch on Fiscal Deficit". Bloomberg. Retrieved 2013-07-18. ^ "Fitch Affirms Ethiopia at 'B'; Outlook Stable". Retrieved 2016-01-26. ^ "France's credit downgraded to AA at Fitch Ratings - MarketWatch". Retrieved 2014-12-12. ^ "Fitch Affirms Georgia at 'BB-'; Outlook Stable". 2017-09-22. Retrieved 2017-12-16. ^ "Fitch Upgrades Greece to 'BB-' from 'B'; Outlook Stable". ^ "Fitch elevates Hungary's debt rating to 'investment grade'". Budapest Business Journal. 2016-05-20. ^ "Fitch upgrades India's outlook to stable, affirms BBB- rating". The Economic Times. New Delhi, India. 12 June 2013. Retrieved 12 June 2013. ^ "RPT-Fitch Revises India's Outlook to Stable; Affirms Ratings at 'BBB-'". Reuters. 12 June 2013. Retrieved 12 June 2013. ^ "Fitch Upgrades Indonesia to 'BBB'; Outlook Stable". 2017-12-20. Retrieved 2018-04-12. ^ "Fitch Upgrades Ireland to 'A+'; Outlook Stable". 2017-12-15. Retrieved 2017-12-16. ^ "Fitch raises Israel's outlook to A+". 11 Nov 2016. ^ "Fitch Downgrades Italy to 'BBB'; Outlook Stable". reuters. 21 April 2017. ^ "Fitch Affirms Japan at 'A'; Outlook Revised to Negative". 2016-06-13. ^ "Fitch Revises Lithuania's Outlook to Positive; Affirms at 'A-'". ^ "Fitch Affirms Macedonia at 'BB'; Outlook Negative". 2017-08-04. Retrieved 2017-12-16. ^ "Fitch upgrades Philippines rating to 'BBB'". Reuters.com. Retrieved 2017-12-11. ^ "Fitch Upgrades Portugal to 'BBB'; Outlook Stable". 2017-12-15. Retrieved 2017-12-15. ^ "Fitch Upgrades Serbia to 'BB+'; Outlook Stable". 2017-12-15. Retrieved 2017-12-16. ^ Kim, Cynthia (2012-09-06). "South Korea Rating Raised by Fitch on Nation's Stability". Bloomberg. Retrieved 2013-02-25. ^ "Spain Has Rating Raised to A- by Fitch on Economic Recovery". Bloomberg. 2018-01-19. Retrieved 2018-01-20. ^ "Fitch Downgrades Turkey to 'BB'; Outlook Negative". ^ "Fitch strips Britain of triple-A credit rating". Reuters. 2013-04-19. Retrieved 2013-04-19. ^ "Fitch Affirms United States at' 'AAA'; Outlook Stable". Fitch. 2014-03-21. Retrieved 2013-03-21. ^ "Fitch Assigns Uzbekistan 'BB-' IDRs; Outlook Stable". ^ "investment grade : defined at Finance Glossary". Finance-glossary.com. Archived from the original on 2012-11-05. Retrieved 2013-02-25. ^ "Moody's affirms Albania's B1 rating, maintains stable outlook". Moody's Investors Service. 2017-08-04. Archived from the original on 2017-08-05. Retrieved 2017-09-23. ^ "Moody's affirms Angola's B1 ratings and maintains negative outlook". Moody's Investors Service. 2017-04-07. Archived from the original on 2017-09-24. Retrieved 2017-09-23. ^ "Moody's changes outlook on the Government of Argentina's B3 rating to positive from stable; ratings affirmed". Moody's Investors Service. 2017-03-06. Archived from the original on 2017-03-07. Retrieved 2017-09-23. ^ "Moody's downgrades Armenia's government bond rating to B1, changes the outlook to stable from negative". Moody's Investors Service. 2016-03-18. Archived from the original on 2016-03-23. Retrieved 2017-09-23. ^ "Moody's affirms Australia's Aaa rating; maintains stable outlook". Moody's Investors Service. Archived from the original on 2017-09-24. Retrieved 2017-09-23. ^ "Moody's downgrades Austria's rating to Aa1 from Aaa; stable outlook". Moody's Investors Service. 2016-06-24. Archived from the original on 2016-06-26. Retrieved 2017-09-23. ^ "Moody's downgrades Azerbaijan's rating to Ba2, with a stable outlook, concluding review for downgrade". Moody's Investors Service. 2017-08-18. Archived from the original on 2017-09-24. Retrieved 2017-09-23. ^ "Moody's confirms the Bahamas' Baa3 ratings and changes outlook to negative, concluding review for downgrade". Moody's Investors Service. 2017-08-25. Archived from the original on 2017-09-24. Retrieved 2017-09-23. ^ "Moody's downgrades Bahrain to B1, maintains negative outlook". Moody's Investors Service. 2017-07-28. Archived from the original on 2017-07-29. Retrieved 2017-09-23. ^ "Moody's Affirms Bangladesh's Ba3 Rating; Maintains Stable Outlook". Moody's Investors Service. 2017-04-17. Archived from the original on 2017-06-24. Retrieved 2017-09-23. ^ "Moody's downgraded Barbados' government bond and issuer ratings to Caa3 and maintained a stable outlook". Moody's Investors Service. 2017-03-09. Archived from the original on 2017-09-24. Retrieved 2017-09-23. ^ "Moody's changes outlook on Belarus's Caa1 government bond rating to stable from negative; affirms Caa1 rating". Moody's Investors Service. 2016-06-17. Archived from the original on 2017-09-24. Retrieved 2017-09-23. ^ "Moody's affirms Belgium's Aa3 government bond rating; stable outlook". Moody's Investors Service. 2017-03-03. Archived from the original on 2017-03-03. Retrieved 2017-09-23. ^ "Moody's upgrades Belize's issuer rating to B3 from Caa2; stable outlook". Moody's Investors Service. 2017-04-11. Archived from the original on 2017-09-24. Retrieved 2017-09-23. ^ "Moody's downgrades Bermuda's rating to A2, outlook stable". Moody's Investors Service. 2016-06-03. Archived from the original on 2017-09-24. Retrieved 2017-09-23. ^ "Moody's changes outlook on Bolivia's Ba3 issuer and bond ratings to stable". Moody's Investors Service. 2017-08-01. Archived from the original on 2017-08-01. Retrieved 2017-09-23. ^ "Moody's affirms Bosnia and Herzegovina's B3 government bond rating; Outlook stable". Moody's Investors Service. 2016-02-26. Archived from the original on 2017-09-24. Retrieved 2017-09-23. ^ "Moody's affirms Botswana's A2 government bond rating; outlook stable". Moody's Investors Service. 2016-04-22. Archived from the original on 2016-04-23. Retrieved 2017-09-23. ^ "Moody's changes outlook on Brazil's Ba2 issuer rating to negative from stable". Moody's Investors Service. 2017-05-26. Archived from the original on 2017-06-24. Retrieved 2017-09-23. ^ "Moody's affirms Bulgaria's Baa2 issuer ratings; outlook stable". Moody's Investors Service. 2017-05-26. Archived from the original on 2017-09-24. Retrieved 2017-09-23. ^ "Moody's affirms Cambodia's B2 issuer rating; maintains stable outlook". Moody's Investors Service. 2017-03-17. Archived from the original on 2017-09-24. Retrieved 2017-09-23. ^ "Moody's assigns B2 first-time issuer rating to the Republic of Cameroon with stable outlook". Moody's Investors Service. 2016-08-05. Archived from the original on 2016-08-07. Retrieved 2017-09-23. ^ "Moody's Affirms Canada's Aaa Rating; Maintains Stable Outlook". Moody's Investors Service. 2016-11-02. Archived from the original on 2016-11-04. Retrieved 2017-09-23. ^ "Moody's Assigns Aa3 local currency rating to the Cayman Islands; Outlook Stable". Moody's Investors Service. 2017-07-17. Archived from the original on 2017-09-24. Retrieved 2017-09-23. ^ "Moody's changes outlook on Chile's ratings to negative; affirms Aa3 ratings". Moody's Investors Service. 2017-08-24. Archived from the original on 2017-08-25. Retrieved 2017-09-23. ^ "Moody's downgrades China's rating to A1 from Aa3 and changes outlook to stable from negative". Moody's Investors Service. 2017-05-24. Archived from the original on 2017-05-24. Retrieved 2017-09-23. ^ "Moody's affirms Colombia's issuer and bond ratings at Baa2 and maintains a stable outlook". Moody's Investors Service. 2016-05-26. Archived from the original on 2017-09-24. Retrieved 2017-09-23. ^ "Moody's downgrades the Republic of the Congo's rating to Caa2, outlook remains negative". Moody's Investors Service. 2017-07-28. Archived from the original on 2017-09-24. Retrieved 2017-09-23. ^ "Moody's downgrades Costa Rica's government bond rating to Ba2, continued negative outlook". Moody's Investors Service. 2017-02-09. Archived from the original on 2017-08-06. Retrieved 2017-09-23. ^ "Moody's changes outlook on the Government of Croatia's Ba2 rating to stable from negative; affirms ratings". Moody's Investors Service. 2017-03-10. Archived from the original on 2017-03-10. Retrieved 2017-09-23. ^ "Moody's changes Cuba's outlook to positive from stable; Caa2 rating affirmed". Moody's Investors Service. 2015-12-10. Archived from the original on 2016-11-29. Retrieved 2017-09-23. ^ "Moody's upgrades government bond ratings of Cyprus to Ba3; maintains a positive outlook". Moody's Investors Service. 2017-07-28. Archived from the original on 2017-07-29. Retrieved 2017-09-23. ^ "Moody's changes Czech Republic's outlook to positive from stable, affirms A1 ratings". Moody's Investors Service. 2018-04-20. ^ "Moody's affirms Denmark's Aaa issuer rating, stable outlook". Moody's Investors Service. 2017-03-24. Archived from the original on 2017-09-24. Retrieved 2017-09-23. ^ "Moody's upgrades Dominican Republic's issuer rating to Ba3 from B1, outlook stable". Moody's Investors Service. 2017-07-20. Archived from the original on 2017-09-24. Retrieved 2017-09-23. ^ "Moody's affirms the Democratic Republic of the Congo's sovereign issuer rating at B3; outlook stable". Moody's Investors Service. 2016-06-17. Archived from the original on 2017-09-24. Retrieved 2017-09-23. ^ "Moody's affirms Ecuador's B3 rating, maintains stable outlook". Moody's Investors Service. 2016-11-23. Archived from the original on 2017-09-24. Retrieved 2017-09-23. ^ "Moody's affirms Egypt's B3 rating; maintains stable outlook". Moody's Investors Service. 2017-08-18. Archived from the original on 2017-08-19. Retrieved 2017-09-23. ^ "Moody's downgrades El Salvador's issuer rating to Caa1 from B3 and changes outlook to stable from negative". Moody's Investors Service. 2017-04-13. Archived from the original on 2017-09-24. Retrieved 2017-09-23. ^ "Moody's affirms Estonia's A1 rating; maintains stable outlook". Moody's Investors Service. 2017-07-21. Archived from the original on 2017-07-22. Retrieved 2017-09-23. ^ "Moody's affirms Ethiopia's B1 Sovereign Rating, the outlook remains stable". Moody's Investors Service. 2016-12-02. Archived from the original on 2017-09-24. Retrieved 2017-09-23. ^ "Moody's upgrades Fiji's ratings to Ba3 from B1; changes outlook to stable from positive". Moody's Investors Service. 2017-09-06. Archived from the original on 2017-09-06. Retrieved 2017-09-23. ^ "Moody's downgrades Finland's rating to Aa1 from Aaa; stable outlook". Moody's Investors Service. 2016-06-03. Archived from the original on 2017-09-24. Retrieved 2017-09-23. ^ "Moody's downgrades France's government bond ratings to Aa2 from Aa1; outlook changed to stable from negative". Moody's Investors Service. 2015-09-18. Archived from the original on 2015-09-21. Retrieved 2017-09-23. ^ "Moody's downgrades Gabon's rating to B3, outlook negative". Moody's Investors Service. 2017-07-03. Archived from the original on 2017-07-04. Retrieved 2017-09-23. ^ "Moody's upgrades Georgia's ratings to Ba2 from Ba3; outlook remains stable". Moody's Investors Service. 2017-09-11. Archived from the original on 2017-09-11. Retrieved 2017-09-23. ^ "Moody's affirms Germany's Aaa government bond rating; maintains stable outlook". Moody's Investors Service. 2017-02-24. Archived from the original on 2017-09-24. Retrieved 2017-09-23. ^ "Moody's affirms Ghana's issuer rating at B3, changes outlook to stable from negative". Moody's Investors Service. 2016-09-23. Archived from the original on 2017-09-24. Retrieved 2017-09-23. ^ "Two-notch upgrade of Greece to B1 stable reflects reform progress, improved fiscal performance". Moody's Investors Service. 2019-03-01. Archived from the original on 2018-02-22. Retrieved 2018-02-22. ^ "Moody's changes outlook on Guatemala's sovereign ratings to stable from negative, affirms Ba1 ratings". Moody's Investors Service. 2016-06-30. Archived from the original on 2017-09-24. Retrieved 2017-09-23. ^ "Moody's upgrades Honduras' ratings to B1 from B2; outlook stable". Moody's Investors Service. 2017-09-22. Archived from the original on 2017-09-24. Retrieved 2017-09-23. ^ "Moody's downgrades Hong Kong's rating to Aa2 from Aa1 and changes outlook to stable from negative". Moody's Investors Service. 2017-05-24. Archived from the original on 2017-06-24. Retrieved 2017-09-23. ^ "Moody's upgrades Hungary's government bond ratings to Baa3; stable outlook". Moody's Investors Service. 2016-11-04. Archived from the original on 2016-11-05. Retrieved 2017-09-23. ^ "Moody's upgrades Iceland's government ratings to A3; outlook stable". Moody's Investors Service. 2016-09-01. Archived from the original on 2016-09-02. Retrieved 2017-09-23. ^ "Moody's upgrades India's government bond rating to Baa2 from Baa3; changes outlook to stable from positive". Moody's Investors Service. 2017-11-16. Archived from the original on 2017-11-17. Retrieved 2017-11-16. ^ "Moody's upgrades Indonesia's rating to Baa2, changes outlook to stable". Moody's Investors Service. 2017-04-13. Retrieved 2018-04-13. ^ "Moody's assigns Caa1 issuer rating to the Government of Iraq; outlook stable". Moody's Investors Service. 2017-08-03. Archived from the original on 2017-08-04. Retrieved 2017-09-23. ^ "Moody's upgrades Ireland's rating to A2, changes outlook to stable from positive". Moody's Investors Service. 2017-09-15. Archived from the original on 2017-09-16. Retrieved 2017-09-23. ^ "Moody's changes outlook on Isle of Man's ratings to negative from stable, affirms Aa1 ratings". Moody's Investors Service. 2016-06-29. Archived from the original on 2017-09-24. Retrieved 2017-09-23. ^ "חברת מודיז מעלה את דירוג האשראי של ישראל לחיובי". Moody's Investors Service. 2018-07-20. Archived from the original on 2017-09-24. Retrieved 2017-09-23. ^ "Moody's downgrades Italy's rating to Baa3, outlook stable". Moody's Investors Service. 2018-10-19. Archived from the original on 2018-10-19. Retrieved 2018-10-20. ^ "Moody's upgrades Côte d'Ivoire's sovereign ratings to Ba3 from B1, outlook stable". Moody's Investors Service. 2015-11-05. Archived from the original on 2016-10-31. Retrieved 2017-09-23. ^ "Moody's upgrades Jamaica's ratings to B3 from Caa2, changes the outlook to stable from positive". Moody's Investors Service. 2016-11-21. Archived from the original on 2017-09-24. Retrieved 2017-09-23. ^ "Moody's affirms Japan's A1 rating; outlook stable". Moody's Investors Service. 2016-08-30. Archived from the original on 2016-08-31. Retrieved 2017-09-23. ^ "Moody's Affirms Jordan's B1 Rating; Outlook Remains Stable". Moody's Investors Service. 2016-11-14. Archived from the original on 2017-09-24. Retrieved 2017-09-23. ^ "Moody's changes outlook on Kazakhstan's rating to stable from negative, affirms government bond rating at Baa3". Moody's Investors Service. 2017-07-26. Archived from the original on 2017-09-24. Retrieved 2017-09-23. ^ "Moody's affirms Kenya's B1 sovereign rating, maintains stable outlook". Moody's Investors Service. 2016-02-12. Archived from the original on 2016-02-13. Retrieved 2017-09-23. ^ "Moody's assigns first-time B2 issuer ratings to Government of the Kyrgyz Republic; stable outlook". Moody's Investors Service. 2015-12-09. Archived from the original on 2017-09-24. Retrieved 2017-09-23. ^ "Moody's affirms Latvia's A3 rating, maintains stable outlook". Moody's Investors Service. 2017-07-14. Archived from the original on 2017-07-15. Retrieved 2017-09-23. ^ "Moody's Downgrades Lebanon's Rating To B3, Changes Outlook To Stable From Negative". Moody's Investors Service. 2017-08-25. Archived from the original on 2017-09-24. Retrieved 2017-09-23. ^ "Moody's affirms Lithuania's A3 rating, outlook remains stable". Moody's Investors Service. 2017-09-08. Archived from the original on 2017-09-11. Retrieved 2017-09-23. ^ "Moody's affirms Luxembourg's Aaa rating; stable outlook". Moody's Investors Service. 2017-03-03. Archived from the original on 2017-03-03. Retrieved 2017-09-23. ^ "Moody's affirms Macao's Aa3 issuer rating; changes outlook to stable from negative". Moody's Investors Service. 2017-05-24. Archived from the original on 2017-09-24. Retrieved 2017-09-23. ^ "Moody's revises Malaysia's sovereign rating outlook to stable, affirms A3 rating". Moody's Investors Service. 2016-11-01. Archived from the original on 2016-01-26. Retrieved 2017-09-23. ^ "Moody's assigns first-time B2 issuer rating to the Government of Maldives; outlook stable". Moody's Investors Service. 2016-09-02. Archived from the original on 2016-09-03. Retrieved 2017-09-23. ^ "Moody's affirms Malta's A3 rating, stable outlook". Moody's Investors Service. 2016-09-02. Archived from the original on 2016-09-04. Retrieved 2017-09-23. ^ "Moody's affirms Mauritius's Baa1 government bond rating with stable outlook". Moody's Investors Service. 2015-11-24. Archived from the original on 2015-11-26. Retrieved 2017-09-23. ^ "Moody's affirms Aaa.mx rating of the Government of Mexico". Moody's Investors Service. 2017-04-27. Archived from the original on 2017-05-03. Retrieved 2017-09-23. ^ "Moody's changes Moldova's rating outlook to stable from negative; B3 rating affirmed". Moody's Investors Service. 2017-01-13. Archived from the original on 2017-09-24. Retrieved 2017-09-23. ^ "Moody's confirms Mongolia's Caa1 issuer rating with a stable outlook, concluding review for downgrade". Moody's Investors Service. 2017-03-30. Archived from the original on 2017-09-24. Retrieved 2017-09-23. ^ "Moody's downgrades Montenegro's sovereign ratings to B1; maintains negative outlook". Moody's Investors Service. 2016-05-14. Archived from the original on 2017-09-24. Retrieved 2017-09-23. ^ "Moody's changes outlook on the Government of Morocco's Ba1 rating to positive from stable; ratings affirmed". Moody's Investors Service. 2017-02-24. Archived from the original on 2017-09-24. Retrieved 2017-09-23. ^ "Moody's downgrades Mozambique sovereign ratings to Caa3, changes outlook to negative". Moody's Investors Service. 2016-07-08. Archived from the original on 2017-09-24. Retrieved 2017-09-23. ^ "Moody's Downgrades Namibia's rating to Ba1, maintains negative outlook". Moody's Investors Service. 2017-08-11. Archived from the original on 2017-08-19. Retrieved 2017-09-23. ^ "Moody's affirms the Aaa issuer rating of the Netherlands; maintains stable outlook". Moody's Investors Service. 2017-03-31. Archived from the original on 2017-09-24. Retrieved 2017-09-23. ^ "Moody's affirms New Zealand's Aaa issuer rating; maintains stable outlook". Moody's Investors Service. 2017-03-24. Archived from the original on 2017-03-24. Retrieved 2017-09-23. ^ "Moody's changes outlook on Nicaragua's B2 rating to positive from stable; rating affirmed". Moody's Investors Service. 2017-07-20. Archived from the original on 2017-07-21. Retrieved 2017-09-23. ^ "Moody's affirms Nigeria's B1 rating with a stable outlook". Moody's Investors Service. 2016-12-09. Archived from the original on 2017-09-24. Retrieved 2017-09-23. ^ "Moody's affirms Norway's Aaa rating; maintains stable outlook". Moody's Investors Service. 2016-03-04. Archived from the original on 2016-03-06. Retrieved 2017-09-23. ^ "Moody's downgrades Oman to Baa2, outlook negative". Moody's Investors Service. 2017-07-28. Archived from the original on 2017-09-24. Retrieved 2017-09-23. ^ "Moody's affirms Panama's Baa2 rating, outlook remains stable". Moody's Investors Service. 2015-12-01. Archived from the original on 2015-12-12. Retrieved 2017-09-23. ^ "Moody's downgrades Papua New Guinea's rating to B2 with stable outlook". Moody's Investors Service. 2016-04-25. Archived from the original on 2016-04-26. Retrieved 2017-09-23. ^ "Moody's affirms Paraguay's Ba1 government bond ratings and maintains a stable outlook". Moody's Investors Service. 2016-06-21. Archived from the original on 2016-06-22. Retrieved 2017-09-23. ^ "Moody's affirms Peru's A3 rating; maintains stable outlook". Moody's Investors Service. 2017-08-23. Archived from the original on 2017-09-24. Retrieved 2017-09-23. ^ "Moody's affirms Philippines' Baa2 rating, maintains stable outlook". Moody's Investors Service. 2017-06-27. Archived from the original on 2017-06-27. Retrieved 2017-09-23. ^ "Moody's changes outlook on Poland's A2 issuer rating to stable from negative; affirms ratings". Moody's Investors Service. 2017-05-12. Archived from the original on 2017-09-24. Retrieved 2017-09-23. ^ "Moody's upgrades Portugal's rating to Baa3, changes outlook to stable". Moody's Investors Service. 2018-10-12. Archived from the original on 2019-02-16. Retrieved 2019-03-16. ^ "Moody's Downgrades $13 Billion of Puerto Rico Bonds, Revises Outlook to Negative from Developing". Moody's Investors Service. 2017-04-05. Archived from the original on 2017-09-24. Retrieved 2017-09-23. ^ "Moody's changes Qatar's rating outlook to negative, affirms Aa3 rating". Moody's Investors Service. 2017-07-04. Archived from the original on 2017-09-24. Retrieved 2017-09-23. ^ "Moody's changes the outlook on the Baa3 issuer rating of Romania to stable from positive, ratings affirmed". Moody's Investors Service. 2017-04-21. Archived from the original on 2017-09-24. Retrieved 2017-09-23. ^ "Moody's changes outlook on Russia's Ba1 government bond rating to stable from negative; affirms rating". Moody's Investors Service. 2017-02-17. Archived from the original on 2017-02-18. Retrieved 2017-09-23. ^ "Moody's assigns B2 first-time issuer ratings to the Republic of Rwanda and stable outlook". Moody's Investors Service. 2016-08-12. Archived from the original on 2016-08-13. Retrieved 2017-09-23. ^ "Moody's downgrades Saudi Arabia's government issuer rating to A1 with stable outlook, concluding review for downgrade". Moody's Investors Service. 2016-05-14. Archived from the original on 2016-05-15. Retrieved 2017-09-23. ^ "Moody's upgrades Senegal's issuer rating to Ba3, outlook stable". Moody's Investors Service. 2017-04-13. Archived from the original on 2017-09-24. Retrieved 2017-09-23. ^ "Moody's upgrades Serbia's issuer rating to Ba3; stable outlook". Moody's Investors Service. 2017-03-17. Archived from the original on 2017-09-24. Retrieved 2017-09-23. ^ "Moody's affirms Singapore's Aaa rating; maintains stable outlook". Moody's Investors Service. 2016-12-08. Archived from the original on 2016-12-09. Retrieved 2017-09-23. ^ "Moody's changes outlook on Slovakia's sovereign rating to positive, affirms A2 rating". Moody's Investors Service. 2017-04-07. Archived from the original on 2017-09-24. Retrieved 2017-09-23. ^ "Moody's upgrades Slovenia's government bond ratings to Baa1, assigns stable outlook". Moody's Investors Service. 2017-09-08. Archived from the original on 2017-09-09. Retrieved 2017-09-23. ^ "Moody's downgrades South Africa's rating to Baa3 and assigns negative outlook". Moody's Investors Service. 2017-06-09. Archived from the original on 2017-06-09. Retrieved 2017-09-23. ^ "Moody's upgrades Korea's ratings to Aa2, outlook stable". Moody's Investors Service. 2015-12-18. Archived from the original on 2017-09-24. Retrieved 2017-09-23. ^ "Moody's upgrades Spain's ratings to Baa1 from Baa2; the outlook remains stable". Moody's Investors Service. 2018-04-13. ^ "Moody's changes outlook on Sri Lanka's rating to negative from stable; affirms government bond rating at B1". Moody's Investors Service. 2016-06-20. Archived from the original on 2016-06-21. Retrieved 2017-09-23. ^ "Moody's changes outlook on St Vincent and the Grenadines' B3 ratings to stable from negative; affirms rating". Moody's Investors Service. 2016-05-19. Archived from the original on 2017-09-24. Retrieved 2017-09-23. ^ "Moody's downgrades Suriname's rating to B1 from Ba3; stable outlook". Moody's Investors Service. 2016-05-20. Archived from the original on 2017-09-24. Retrieved 2017-09-23. ^ "Moody's assigns B2 first-time issuer ratings to the Government of Swaziland, with a negative outlook". Moody's Investors Service. 2017-10-27. Archived from the original on 2017-10-28. Retrieved 2017-10-27. ^ "Moody's affirms Sweden's Aaa/P-1 ratings; stable outlook". Moody's Investors Service. 2016-04-08. Archived from the original on 2017-09-24. Retrieved 2017-09-23. ^ "Moody's affirms Switzerland's Aaa rating and maintains a stable outlook". Moody's Investors Service. 2016-12-02. Archived from the original on 2017-09-24. Retrieved 2017-09-23. ^ "Moody's affirms Taiwan's Aa3 rating; maintains stable outlook". Moody's Investors Service. 2016-11-17. Archived from the original on 2017-09-24. Retrieved 2017-09-23. ^ "Moody's assigns first-time B3 issuer rating to the Government of Tajikistan; outlook stable". Moody's Investors Service. 2017-08-28. Archived from the original on 2017-09-24. Retrieved 2017-09-23. ^ "Moody's affirms Thailand's Baa1 rating, maintains stable outlook". Moody's Investors Service. 2017-07-18. Archived from the original on 2017-09-24. Retrieved 2017-09-23. ^ "Moody's downgrades Trinidad and Tobago's issuer rating to Ba1 from Baa3 and changes outlook to stable from negative". Moody's Investors Service. 2017-04-25. Archived from the original on 2017-09-24. Retrieved 2017-09-23. ^ "Moody's downgrades Tunisia's rating to B1, maintains negative outlook". Moody's Investors Service. 2017-08-18. Archived from the original on 2017-09-24. Retrieved 2017-09-23. ^ "Moody's downgrades Turkey's sovereign ratings to Ba2 from Ba1; outlook changed to stable from negative". Moody's Investors Service. 2018-03-07. Archived from the original on 2018-03-07. Retrieved 2018-03-08. ^ "Moody's downgrades Uganda's rating to B2, outlook stable". Moody's Investors Service. 2016-11-18. Archived from the original on 2017-09-24. Retrieved 2017-09-23. ^ "Moody's upgrades Ukraine's rating to Caa1 from Caa2; outlook changed to stable from positive". Moody's Investors Service. 2018-12-21. Archived from the original on 2018-12-21. Retrieved 2018-12-21. ^ "Moody's changes rating outlook on the UAE to stable from negative; affirms Aa2 issuer rating". Moody's Investors Service. 2017-05-27. Archived from the original on 2017-05-30. Retrieved 2017-09-23. ^ "Moody's downgrades UK's rating to Aa2, changes outlook to stable". Moody's Investors Service. 2017-09-22. Archived from the original on 2017-09-22. Retrieved 2017-09-23. ^ "Moody's changes outlook on US Aaa sovereign rating to stable from negative; rating affirmed". Moody's Investors Service. 2013-07-18. Archived from the original on 2013-07-21. Retrieved 2017-09-23. ^ "Moody's changes outlook on Uruguay's Baa2 rating to stable from negative; rating affirmed". Moody's Investors Service. 2017-07-13. Archived from the original on 2017-09-24. Retrieved 2017-09-23. ^ "Moody's assigns issuer rating of B1 to the Government of Uzbekistan, outlook stable". Moody's. 2019-02-13. Retrieved 2019-02-14. ^ "Moody's changes outlook on Venezuela's Caa3 rating to negative from stable; Caa3 rating affirmed". Moody's Investors Service. 2016-03-04. Archived from the original on 2016-04-02. Retrieved 2017-09-23. ^ "Moody's: Outlook for Vietnam banking system is positive; strong economic prospects". Moody's Investors Service. 2017-11-01. Archived from the original on 2017-11-07. Retrieved 2017-11-01. ^ "Moody's downgrades Zambia's issuer rating to B3 with negative outlook". Moody's Investors Service. 2016-04-19. Archived from the original on 2016-04-20. Retrieved 2017-09-23. ^ a b c d e f g h i j k l m n o p q r s t u v w x y z aa ab ac ad ae af ag "Sovereign & Supranationals | Rating Lists". Japan Credit Rating Agency. Archived from the original on 2013-09-28. Retrieved 2013-11-03. ^ "JCR News Release: Slovenia" (PDF). Japan Credit Rating Agency. 2016-08-15. Retrieved 2017-09-09. ^ "China bans ratings business of Dagong agency". Deutsche Welle. Retrieved 17 August 2018. ^ a b c d e f g h i j k l m n o p q r s t u v w x y z aa ab ac ad ae af ag ah ai aj ak al am an ao ap aq ar as at au av aw ax ay az ba bb bc bd be bf bg bh bi bj bk bl bm bn bo bp bq br bs bt bu bv bw "Sovereign Ratings". Dagong Global Credit Rating Co., LTD. Archived from the original on 8 January 2015. Retrieved 12 January 2015. ^ a b c d e f g h i j k l m n o p q r s t u v w "Dagong Downgrades the Foreign Currency Sovereign Credit Rating of Argentina to D". Dagong Global Credit Rating. Archived from the original on 2014-08-16. Retrieved 2014-07-31. ^ "Dagong gives BBB+ sovereign credit rating to Colombia". News.xinhuanet.com. 2012-03-31. Archived from the original on 2013-10-01. Retrieved 2013-02-25. ^ 大公信软. "DAGONG GLOBAL CREDIT RATING CO., LTD". en.dagongcredit.com. Retrieved 2018-01-17. ^ "China's Dagong Cuts Venezuela Rating". Latin American Herald Tribune. 5 December 2016. Retrieved 6 December 2016. ^ "中诚信国际：意大利政治不确定性对其主权信用带来负面影响". 中诚信国际. Retrieved 19 April 2013. ^ "中诚信国际：西班牙主权评级维持BBg+，评级展望由稳定调为负面". 中诚信国际. Retrieved 19 April 2013. ^ "中诚信国际：下调英国主权评级至AAg+，评级展望为稳定". 中诚信国际. Retrieved 19 April 2013. ^ "Mali given credit rating under UN development initiative". United Nations Organization. 2004-05-06. Retrieved 2013-02-25. ^ "Fitch withdraws Mali's ratings". Reuters. 2009-12-04. Retrieved 2013-02-25. This page was last edited on 9 April 2019, at 12:48 (UTC).